Performers Penny Schwarze, Edward Martin, William Bastian, Bianca Aspin, Shelley Gruskin and LeAnn House. An upcoming concert will give audiences the chance to experience what music was like four centuries ago. "Music from Shakespeare's Time" takes place at 7:30 p.m. Saturday, Oct. 8 in the Mitchell Auditorium. The concert is being presented in conjunction with the exhibit of Shakespeare's First Folio at the University of Minnesota - Duluth. The performance will include music associated with some of Shakespeare's plays, all performed on replica Renaissance instruments. 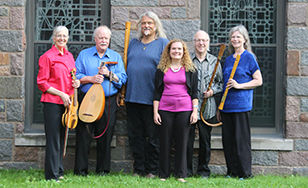 It will feature William Bastian, tenor; Bianca Aspin, mezzo soprano; Edward Martin, lute; Shelley Gruskin, recorders, krummhorns (a medieval wind instrument), rauschpfeife (a type of pipe); Penny Schwarze, viols (six-stringed instrument from the Renaissance and Baroque periods); and LeAnn House, keyboards. "Music from Shakespeare's Time" is the first presentation of the annual Cambiata Music Series. Tickets are $10 for general admission.